This package provides an essential feature to LaTeX that has been missing for too long. It adds a coffee stain to your documents. A lot of time can be saved by printing stains directly on the page rather than adding it manually. 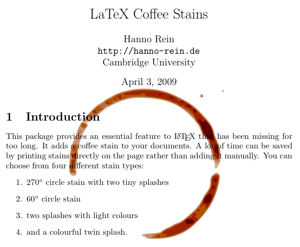 coffee.pdf – This is an example of all included stains and also the documentation of the package. coffee.tar.gz – This archive contains all files including the documentation (you probably want to download this). coffee.sty – This is the actual package which contains everything including the images. coffee.tex – This is the source code of the example file. coffee2.sty – This is an improved version that works with pdflatex. Thanks to Evan Sultanik! coffee3.tar.gz – This is another improved version that works with pdflatex. It allows you to scale, rotate and change the transparency of any coffee stain. Thanks to Professor Luis Randez! coffee4.tar.gz – Adrian Robson sent me this improved version. He writes: “I find I rarely manage to put my coffee mug down exacly in the middle of my papers.